Audiobook purchases by US libraries are about to expand thanks to new apps for library patrons created by library ebook distributors. Here are four major library distributors and their new audiobook apps. Patrons can use these apps to check out and download library audiobooks, and these apps may help you get your audiobook into libraries. A big news story this May was the launch of Harlequin Audio, a joint project of Harlequin and HarperCollins Publishers. Two people, one from each company, Reka Rubin senior manager of subsidiary rights for Harlequin, and Sean McManus associate publisher of HarperAudio, are at the helm of this new imprint, . Harlequin Audio intends to replicate the high production values of Harper Audio’s successful audiobooks. The plan is for Harlequin Audio to release 200 titles this year, starting on June 30th. These audiobooks will be distributed to both retail and library markets. Harlequin audiobooks on CD format will be distributed via Blackstone Audio, located in Ashland, Oregon and one of the largest independent audiobook publishers in the US and Midwest Tape, a media distributor for libraries, located in Holland, Ohio. Overdrive is the largest library distributor of ebooks to libraries. Recently in April, OverDrive was acquired by the Japanese company Rakuten, owner also of Kobo eReaders. OverDrive is now a subsidiary of one of the largest Internet services providers in the world. In May, OverDrive launched OverDrive Listen, a new web app which lets readers listen to audiobooks through their web browsers. Users of libraries can now browse their libraries’ catalog on OverDrive’s website and and check out audiobooks via the Listen app. If the publisher of the audiobook permits, patrons can immediately stream the audiobook on their web browser. Overdrive audiobooks can be played on Windows PCs, Macs (with Safari and OS 7 or higher) , and on Android devices (with Chrome 4.1 or higher). But the OverDrive app isn’t currently compatible with Kindle or Nook devices. Special navigation aids on OverDrive Listen include bookmarks and the ability to “flip” back and forth between chapters. Variable speed control allows for customization the audiobook sound. Mobile devices can play these audiobooks, but listeners may prefer using a tablet or desktop, or one of the two apps discussed below. If seeking mainstream and scholarly published books, mobile device users may want to investigate the Axis 360 app for mobile users. This app, called axisReader, was released in May 2013. It comes from library distributor Baker & Taylor (B&T). Ebsco, another venerable library book distributor offers an app called Ebscohost. This too is a web browser-based app. There is an extensive help guide for Ebsco audiobooks available online. For self-publishing authors the variety of all of these audiobook formatting choices may pose a dilemma. First, there is the decision whether to format an audiobook for eReader devices, or to put it on CD, and/or format it for web browsers. As far as library sales go, audiobooks on CD and/for OverDrive’s streaming browser service via its Listen app seem the simplest and most likely choices to pay off. Nevertheless, getting libraries to buy your self-published audiobook can be a challenge. You’ll need to do some research. 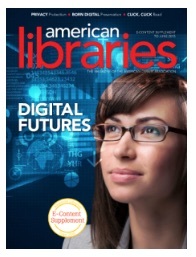 The American Library Association’s American Libraries magazine, read widely among librarians, recently put out a new e-content supplement called Digital Futures. Here is where self-publishers can find out what librarians are currently thinking about and doing with digital publishers and books. Thed June 2015 edition (free online) has an article on page ten that discusses how small publishers and libraries can connect. The title of the article is, “Building Out the Book Niches“. As a self-publisher, you have much in common with new small publishers. In particular, it’s essential for you to try to get your audiobook reviewed by a review source created just for librarians. Here are five review sources that cover audiobooks. Not all will accept self-published audiobooks, but review journals that exclude self-publishers are gradually changing. In addition, the reviews in these sources will give you an idea of what librarians seek in audios they buy. Check the submission guideline links below and query the listed editor if you are in doubt about whether your book could be considered. AudioFile a free online magazine with an additional subscription service, features reviews of 400 audiobooks every two months. It also offers linked lists of premier audiobook publishers, profiles of some publishers, and a directory of narrators. The site also feature “Earphone Awards” winners and feature articles. See “Contact Us” at AudioFile for further assistance. Booklist and Booklist Online are well-known, comprehensive sources of book reviews about books of interest to adults and children. Booklist’s audience is primarily school librarians and public library librarians. Reviews include audiobooks and spoken word audios. See Submitting Review Material to Booklist for submissions information. Note that the section on E-Book Only Submissions states that to be considered for review your audiobook must be available through one of the library ebook-subscription apps discussed at the top of this article. The Horn Book: Publications of books about children and young adults, one monthly and the other semi-annual, feature review children’s and young adult books that are published in the United States. The Horn Book Magazine includes audiobooks, but editors are very selective. The Magazine will only consider books produced by publishers that are listed in Literary Market Place (available at most libraries). See The Horn Book Submissions page for more information. Library Journal: Library News, Reviews, and Views This book review source is the most popular with all types of librarians and library staff in the US and elsewhere. LJ covers a wide variety of topics and interests. Reviews are written by librarians for librarians. Reviews of audiobooks on CD format are included. See the AUDIO link at the top of the “Submit Materials” page for instructions on how to get an audiobook reviewed. School Library Journal is “the world’s largest reviewer of books, multimedia, and technology for children and teens”. Audiobooks and audio CDs are both accepted, but the selection process is quite competitive. SLJ accepts only books from established publishers. Its reviews can be either laudatory or critical, so don’t submit if you feel your audiobook isn’t of topnotch quality. For eligibility requirements and how to get reviewed, see the the “DVDs and Audio Recordings” section of SLJ’s Submissions terms and conditions. For more on which librarians purchase books and how they do it, see my guide, Marketing Your Book to Librarians: An Insider’s Guide for Authors, on sale this summer for a limited time only. Use my savvy strategy for getting your book(s) reviewed by the magazines most librarians use to order books. The Audio Publishers Association’s latest report on the group’s sales survey reported that 6 million more audiobooks were sold in 2012 than in 2011. This resulted in a revenue increase of 13.5 percent. The total number of titles has been nearly doubling each year. 13,255 audio titles were published in 2012. CDs represented more than one-third of the market for audiobooks. If you are thinking about creating an audiobook, you may want to connect with The Audio Publishers Association (APA) for more information. This organization is a not-for-profit trade association consisting of audio publishing companies, allied suppliers and distributors and retailers of spoken word products.